Some of their past legends of Grand Prix racing have paid tribute to Yamaha after Maverick Viñales secured the factory their 500th victory in the sport on Sunday with his incredible victory over teammate Valentino Rossi at the French Grand Prix in Le Mans. Yamaha secured victories in the 125cc (47 wins), 250cc (165 wins), 350cc (63 wins), 500cc (120 wins), and MotoGP class (105 wins), adding up to 500 Grand Prix wins in total, according to FIM statistics. “My first invitation by Yamaha to Japan was very exciting and it was amazing for me to race in the first Suzuka GP. When I returned to Yamaha's base at Hamamatsu after this event to recover from days of testing and the race, I was later invited to ride their factory bikes in the 1964 season, but only five GP's would be factory supported. “The highlights of my time with Yamaha are obviously my three World Championships. I raced six years of Grand Prix with them and I was on the podium 64 times in just over 80 races so we had a lot of success together. Yamaha‘s DNA is racing. 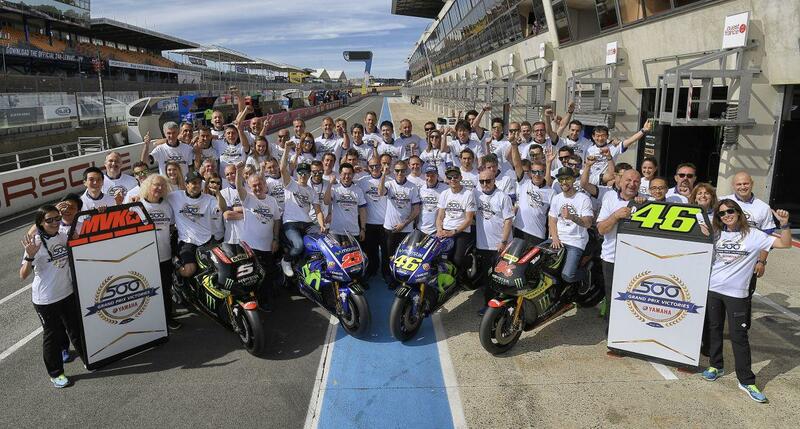 I won 24 races with Yamaha and I can say that every time I raced with them they were all in. We squeezed every bit of performance out of the bike, out of myself and out of the team. Yamaha was as committed to the project as I was. We couldn‘t have accomplished all that we did without each other. We were a great team. “In 1978 when I didn't ride for the factory, I won the World Championship and then the Japanese manufacturer said: 'No, he is riding for me!' So I went to Japan in February, but didn't sign a contract immediately. I went out and tested, broke my back, ruptured my spleen, broke my left collarbone and they didn't know at the time whether I would live or ever race again. I lay in hospital for three weeks with tubes everywhere and I thought they were not going to sign the contract with me, but Mr. Hada, who was the head of all racing and legendary at the time, walked in the hospital one day and said 'Come on, son, we have a contract to sign!'. That's Yamaha, it's a big Japanese family.